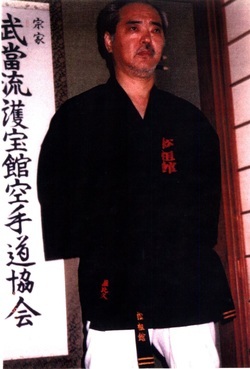 Yabiku, Takaya Hanshi started training in Karate at an early age, he trained with his father and uncle. Also for many years a student of Hohan Soken and Irimaji Seiji of Kojoryu, Takaya Yabiku is the leading student of Irimaji Seiji of Kojoryu. He continued his karate training in several different karate systems such as Uechiryu, including kobudo training under the guidance of Saburo Kochinda and Takeo Mekaru. Takaya Yabiku received the title of Renshi from Hohan Soken and Kyoshi from Seiji Irimaji. Yabiku Hanshi is considered one of Okinawa's finest Hakutsuru practitioners. The kata listed are by no means the only kata that qualify as Okinawan, * "these are just the ones that I teach", all Okinawan Kata are welcome regardlless of style. We do not sanction sport kata's, they must be original Okinawan kata and not some kata that has been altered for sports. What is traditional Karate?, well it is not what is taught in most schools today, that includes Okinawa. Not that there are no traditional methods taught today in Okinawa, there are some small styles that still do follow the old Village Karate, instead of the modern School karate..
1) Traditional Karate is not taught to a large group as done today where all do the Kata in unison, and all learn the Kata same way. That is school karate taught brought into Okinawan schools to make students fit for military service. 2) There is no free sparring. 3) Different Kata are taught to each student depending on his/her built and skill, they are not done in unison or group and not all had to learn the same Kata's. 4) Students come and do their own warm up and learn kata from seniors and practice the Kata alone until they feel they have perfected it. 5) Gi is not required, practice whatever makes you feel comfortable to work out in. 6) The majority of Karate teachers taught only part time, and to only a very few students. 7) Payment if any, was in form of helping the master with his chores or they may have brought food to the master. 8) There were no Styles, masters would send their students to other masters for his specialized skill to teach their students, whether it was Shorei-Te, Shuri-Te or Tomari-Te made no difference. Unlike today if you went to another school outside of your style you would not be accepted at the same rank, and most likely thrown out of your organization for not being loyal to your style. 9) Kobudo was part of the training by all the schools and not separate as it is today. Some masters did specialized in Kobudo, and were also masters of karate but mainly taught weapons. We are preserving Okinawan Traditional Karate and Kobudo regardless of Okinawan Style, originally there were no styles as today, that all came into being to be accepted by the Japanese Budo Association you had to have a name and style. After World War ll this was brought further yet with students from former masters starting their own style, a modern money making thing. Also Kobudo was originally taught as a part of your Karate training, there were no separate ranks given for Kobudo as is done today. Only if you decided to specialize in Kobudo and mainly practiced only Kobudo was there then rank given. Originally in Okinawa there was no rank or belt given, that really didnt take hold in full force until after WWll, before that you were either Number one student or number 2 etc. Okinawans were very slow at accepting the rank system from Japan. The time in grade was also not followed that is a modern thing adopted from Japan, before it was adopted, the Master would decide when you were ready to learn more advanced techniques. A lot of the so called Masters of Karate who adpted the rank structure and time in grade , themselves did not adhere to time in grade to receive their 10th Dan, as is called for today by their respective styles. Being a part of Matsusokan also gives you direct ties to Okinawa, and the ability to visit and train on the island with Takaya Yabiku, Sensei.